I’ve been blogging for almost 9 years – it’s actually scary to think it’s been so long! I started ‘Keeping Slim and Getting Stylish’ (cringe) and never looked back. I wouldn’t be where I am today if it wasn’t for blogging – I’ve won Blogger of the Year, been nominated for another award and have had two book deals off the back off my blogging! But over the last 9 years lots of things have changed when it comes to blogging – and if you’re wanting to blog with a business purpose that’s a different kettle of fish too. 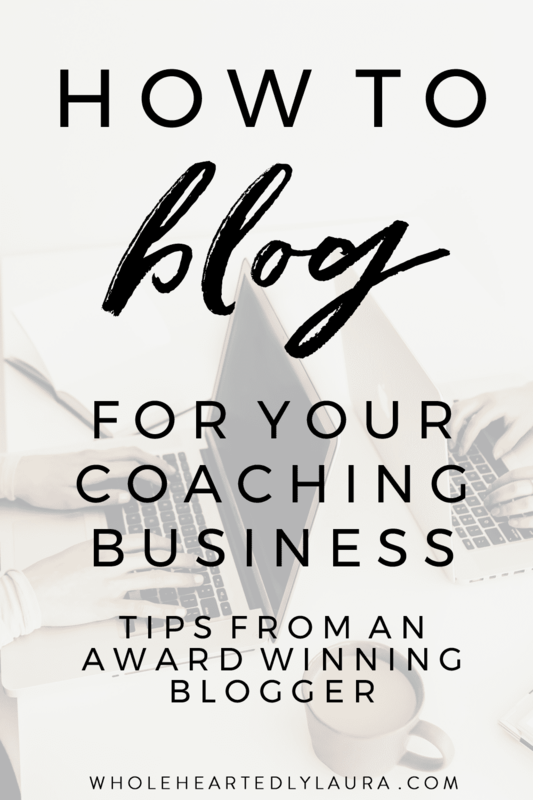 The first thing you need to get clear on when it comes to blogging for your coaching business is the ‘why’. What do you hope to achieve with your blog? Of course you can just blog for enjoyment, but if you want to do it to grow your business there’s a lot more involved than just writing a post and hitting publish. So why might you want to start a blog? Blogging is still a brilliant way to connect with potential clients. You’re able to share helpful information, show them how you can help them and support them to get to know, like and trust you – this is important because people buy from people they know, like and trust. Blogging can also help you build your email list, get more traffic to your website, position you as an expert, create a community and more. Then you need to look at how you’re going to share it. When it comes to deciding what content to create, think about your business and your core message. What problem or problems are you solving for people? What do you want to be known for? You can then use a tool like Google Keyword Search or Pinterest (just type different things into the search box – new search terms will pop up) to get ideas for blog post titles and create your content from there. You can also find a helpful content planning exercise, and a strategy for mapping out your blog posts in my free Visibility Planner here >>> Don’t forget that sometimes the most unplanned, vulnerable and personal blog posts are the ones that people really connect with. Don’t be afraid to share them alongside the more strategically planned ones. Always try and use good quality images that are Pinterest appropriate – i.e. include at least one image that can be pinned as a portrait aspect image with the post title on top. End your post with some kind of ‘call to action’ – i.e. what action would you like people to take after reading your blog post? Leaving a comment? Signing up for your list? Don’t be afraid to include relevant links to other people’s posts and your own within the main content. This can help with Search Engine Optimisation (for what that’s worth – more on that in a sec). INCLUDE A CONTENT UPGRADE (optional but awesome) This is the number one thing to include on your post – a content upgrade is what you’ll find linked to above ^ and at the end of this post. It’s basically an invitation for any readers to get even more useful awesome content from you in exchange for their email address and getting them on your list. This can be a super effective way to build your list when you combine this with one of the strategies below. Now you have your wonderfully written post with fab images and a great title based on keyword searches and you’ve pressed publish so it’s up on your blog – but now what? Whew, I hope that’s been helpful! 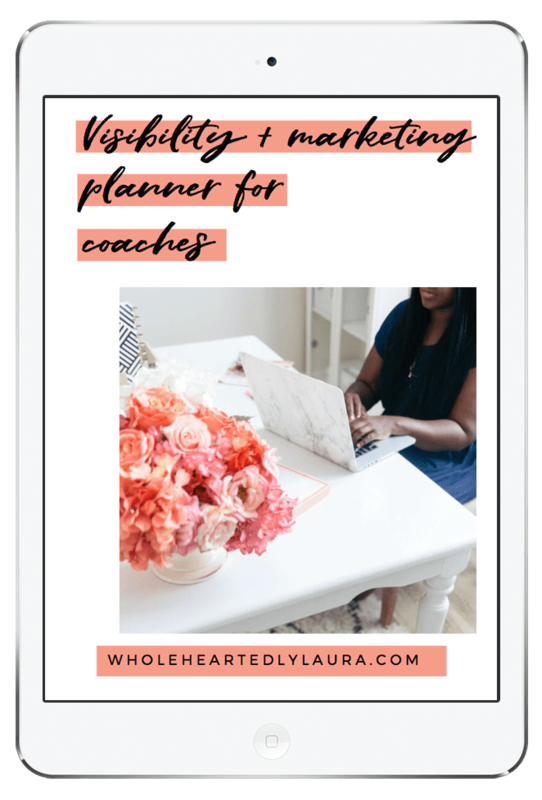 If you’re interested in blogging and generally being more visible for marketing your business check out my totally free Visibility Planner, you can sign up for it below. It will help you get super organised when it comes to your online marketing, check it out! Thanks for requesting your Visibility Planner! Please check your inbox to confirm your subscription and I'll send you the link straight out!